Past or present, who is or was the best time trialist? Last Post 10/20/2009 05:11 PM by Joe Notarnicola. 12 Replies. Cancellara is certainly one of the finest time trial riders in recent years, and is usually one of the first names mentioned in a discussion such as this. Twice the world time trial champion and once the Olympic champion, Spartacus has also won his national time trial championship six times, including five consecutive, before essentially deciding in 2009 that it wasn't enough of a challenge for him. He's been lethal in prologue time trials to stage races, winning nine of them, as well as this year's prologue-that-wasn't-called-a-prologue kicking off the Vuelta a España. He's also won one standard time trial of the Tour de France (and will probably get another as soon as Stefan Schumacher's results from 2008 are formally vacated) as well as being part of a team time trial win in the 2006 Vuelta. Rogers was dominant in championship level competition for a period of three years. From 2003-2005, the only man to better him in the world time trial championship was an artificially-enhanced David Millar. 2006 saw his new T-Mobile Team have him focus more on the Tour de France, so he did not defend his championship for a third time. Injury and illness kept Rogers from the highest level of the sport in 2007 and 2008, and his return in 2009 saw him win his national time trial championship for the first time. In the United States national time trial championship, Zabriskie has been about as approachable in the last six years as Mark Cavendish is in a field sprint. He won the stars and stripes jersey for a fifth time just recently. At the world level, he's yet to win a rainbow jersey, but he made the podium in 2006 and 2008. In 2005, Zabriskie won time trials in both the Giro d'Italia and the Tour de France, taking the yellow jersey in the Tour after his win there. CSC and Garmin have also been good team time trialing squads with Zabriskie heading them, picking up major TTT wins in 2004 at the Vuelta, 2005 at the Tour Méditeranéen, twice at Eindhoven, and a surprising win last year at the Giro d'Italia. Leipheimer hasn't been very active in championship competition, and one wonders if he had been what he may have been able to win. Leipheimer has numerous TT wins in stage races, most notably in the 2007 Tour de France and the 2008 Vuelta a España, where he went 2-for-2 in ITT's. Part of the TTT-winning Astana team at this year's Tour de France, Leipheimer also has an Olympic bronze to his credit in time trial competition. Leipheimer has dominated the time trials at the Tour of California, winning that event's yearly ITT in Solvang each of the last three years; he also won the Tour of California prologue TT in 2007. Leipheimer also has ITT wins at the Vuelta a Castilla y León and the Dauphiné Libéré. 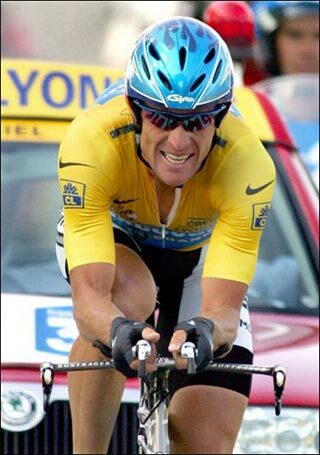 Forget Puerto - Ullrich was, before his little doping downfall, always thought of as one of the best against the clock. In 1995, Ullrich, 22 at the time, won his national time trial championship. Not the Under-23 championship - the Elite national championship. He won it again in 1997 before moving on to other things. In his last two pre-Lance years at the Tour, he won three ITT stages. In 1999 and again in 2001, he won a rainbow jersey for his time trialing, and in 2000 he was on the second step of the all-Team Telekom podium at the Olympic time trial. Even just before Puerto ended his career, Ullrich won an ITT at the 2006 Giro d'Italia, when he was by his own admission not on his best form. Indurain is one of the true legends of the sport, and just like any, part of his legend lies in the time trial. He won at least one ITT each year he won the Tour, and was most dominant in 1993, winning the prologue and both longer time trials that occurred later in the race. Indurain was also successful in championship competition, winning the rainbow jersey in 1995 and the first ever ITT Olympic gold in 1996. You can't even say LeMond's name without thinking of the epic Champs-Élysées ITT in 1989. It's simply the most dramatic time trial ever, hands down. LeMond also won time trials in 1985 and in 1986 en route to his first Tour overall win, as well as a time trial earlier in the 1989 Tour. LeMond also has in his palmarès time trial victories in the old Tour DuPont, the Tour de l'Avenir, and the Dauphiné Libéré. Two years ago, Contador wouldn't have belonged in this discussion. Pretty much everyone thought he'd lose his tenuous lead in the 2007 Tour de France in that race's last ITT. Well, he didn't, as we well know, and ever since then he's gotten better and better in the time trial. He entered his national time trial championship this year thinking of it as a training race, and came away with a convincing victory, with only one man within a minute of his winning time. Since his first Tour de France victory, he's been picking up ITT wins left and right, with six ITT victories and a TTT in top level stage races over the last two years to go along with his national championship. He missed the podium at the 2008 Olympics in the time trial by just a few seconds, thanks to his teammate Leipheimer. Outside of his victories, Contador has shown himself to be competent and able to defend his overall position in any time trial. Even before he became a more accomplished time trialist, Contador had ITT wins in 2003 in the Tour of Poland and in 2005 in the Tour of the Basque Country. Boardman was so good in the short ITT in his heyday that he was actually nicknamed "Mr. Prologue." Boardman's road successes were borne out of skills on the track, as he won three amateur national championships in track pursuit from 1989 to 1991, and Olympic gold in 1992 in the 4,000 meter individual pursuit. Boardman won a unique trifecta two years later, getting a rainbow jersey both on the track and on the road as well, of course, as the victory in the prologue to the Tour de France. In the 1996 Olympics, Boardman kept to the road and took the bronze in the first ever road time trial. All tolled, Boardman won three Tour de France prologues (though doesn't it seem like more?) as well as one in the Dauphiné Libéré. Wiggins is a legend on the track, and is just starting to fully focus on the road. His Olympics and world championships medal record would take up far too much space to fully enumerate. His best claim to fame is being the only rider to ever successfully defend an Olympic title in the 4,000 meter individual pursuit, to go along with seven world championships. His somewhat limited road palmarès is almost all ITTs, with victories in the time trial in the Tour de l'Avenir, the Circuit de Lorraine, the Dauphiné Libéré, Four Days of Dunkirk, and Three Days of De Panne. His Garmin team was also the winner of the team time trial at this year's Tour of Qatar. Not exactly the biggest name on this list, but with the rainbow jersey currently on his shoulders, he belongs in the discussion. His victory in the 2008 world time trial championship was dominant, beating Svein Tuft, probably the finest time trialist Canada has to offer, and Zabriskie by nearly a minute. He also won the German national time trial championship for the third time earlier this season, and has a handful of stage race ITT victories. Now here's the "biggest" name on the list. More a rising star to watch in the future than someone who really deserves this mantle now, and more an all-rounder in the Alejandro Valverde mold than a pure time trialist, Boasson Hagen has an impressive palmarès for a 22 year old, already a three-time Elite national time trial champion after winning the Under-19 ITT championship once, and the U19 road race championship twice. 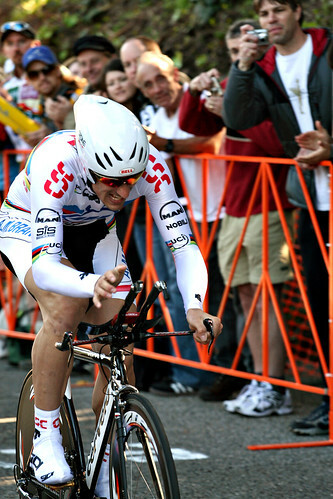 In 2008, at age 21, he entered the Elite world championship in the time trial, finishing a respectable 21st. This season, he was part of Columbia-High Road's Giro d'Italia team time trial winning squad, and won an ITT at the Eneco Tour on his way to winning that race overall. Lance's legacy will always be his climbing legs, but he was, and just maybe still is, the truest all-rounder in recent memory. He won at least one ITT in each of his Tour de France wins except in 2003, and duplicated Indurain's 3-for-3 from 1993 in the 1999 Tour. His team won the team time trial in his last three Tour-winning years, and again this year. He's won ITTs both long and short in other events as well, including the Tour DuPont, the Dauphiné Libéré, the Tour de Georgia, the Volta ao Algarve, Olympic bronze in 2000, and many more. I don't imagine any of us actually saw the great man race, but you don't win eleven Grand Tours without being sharp in the time trial. He won twelve, including prologues and split stages, over his five Tour de France wins alone. His victory in the time trial over Jacques Anquetil in the 1969 Paris-Nice was thought at the time as installing him as one of the world's best in the discipline - and it was only just the beginning. Who do you think of as the best time trialist? Pretty good list already. I guess you could throw in Jacques Anquetil. My personal favorite is Indurain. I was lucky enough to be able to watch his TT win in the 1994 Tour, between Perigeux and Bergerac. Yeah, the list is a little light on people from before this decade. I don't really know who was the Cancellara-esque time trial assassin but not a GC threat in LeMond's and Indurain's day. That is, if there was one. I was thinking about Alex Zülle, Tony Rominger, and Igor González de Galdeano, but I'm just not as familiar with them as I am with the riders I listed (and do remember, the list is just meant as possibilities). I almost didn't include Merckx, until I realized this is a cycling board and a thread about who was the "best" at something. Then I felt like smacking myself. Specific statistics are also a bit hard to come by for Merckx's time and before, though apparently Steve is cooking up something to deal with that. Yep, the "application" is in the oven, it will take a bit of time to get all of the drill down stats and data together, but it will be helpful to see winning percentages in TT's, and eventually some way to compare the competitors to weigh the win. The other thing that makes it hard to compare is that the grand tour riders couldn't let down their guard in the big races to take it easy on the last climb or a final run in for a stage to help recover for an upcoming TT. Contador on the 2009 TdF TT was a hoax. Dude was climbing, seated, mouth closed, at least a 53x11, + he beat Fabian. That is either inhuman VO2Max or I'm gullible. For me its either LeMond for how he contributed to the discipline or Cancellara for his ability to take out any TT event. Catch me up to speed, bro. Who is JA?